Rayna Dutt a sensuous yet sensitive model wakes up with a hangover, to catch a private jet for a destination wedding… and I was hooked. To add to Rayna’s feisty charm, there were RBILs (full form not to be disclosed here) dispersed all over the book making her the most appealing heroine. Hottie Neel (love the name), high flying businessman with down to earth upbringing, responsibilities and fears comes across as a real man close to my heart. 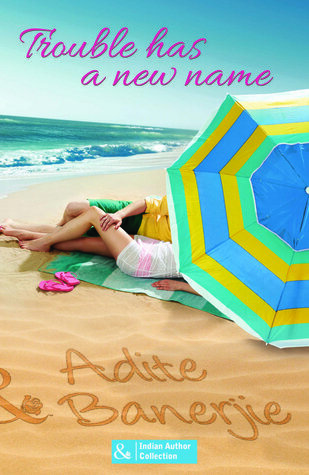 Adite Banerjee has skillfully woven the backstories of both Neel and Rayna adding depth to the story. The setting of picturesque Nirvana resort, sandy beaches, starry nights and a destination wedding on the Emerald Island was like sprinkling of icing on a fabulous cake (read tale). The sizzling chemistry between the reluctant Neel and emotional Rayna has been handled beautifully. The characters of hilarious Agra Aunty, Sid, Karisma and Shah are bang on, adding spice to the already fabulous plot. The book keeps one at a fast roller-coaster ride of emotions ranging from humour, naughty teasings, heart-wrenching conflicts between the two protagonists and ending with the touching surrender by Neel before true love. Adite Banerjie discovered Mills & Boon romances and their amazing assortment of drool-worthy TDH heroes in her teens. Around the same time she fell in love with song-and-dance Bollywood romances. Growing up in a home with a filmmaker dad who worked in the world’s largest film industry (yes, Bollywood!) and a voracious reader for a mom, it was inevitable that she would come to love both films and books. During her exciting and fulfilling career as a business journalist, she found the time to indulge her passion for both Bollywood romances and M&Bs. But after years of reporting and writing about the real world, she chose to return to her love for fiction and turned screenwriter. She turned Harlequin author after winning the 2012 Passions Aspiring Authors Contest. The Indian Tycoon’s Marriage Deal, based on the winning short story for the Harlequin contest, was released in December 2013 in India. Previous Post There’s no such thing as writer’s block!